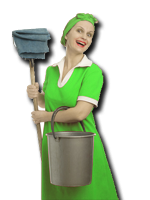 There are many different interpretations of what "green" means in terms of cleaning. Some people believe that green cleaning means creating as little waste as possible, but for the majority of Americans it means using cleaning solutions that are free of harmful chemicals like chlorine, phosphates or artificial colors and fragrances. Those who fall into the latter category choose natural cleansing and abrasive ingredients like baking soda, vinegar or lemons to do the dirty work around the house. Those who try to limit their cleaning waste may only use products that use recycled material for their packaging or choose to buy products from eco-friendly businesses that donate a portion of the proceeds to charity. Tea makes an excellent cleaner for hard wood floors. Take two teabags (black tea works best) and brew them in hot water. Allow the water to cool to room temperature, then mop the floors like you normally would. There's no rinsing required, and your floors will be spotless! Ditch the artificial air fresheners! While almost all aerosol air fresheners are now CFC free, the spray bottles still do damage in landfills. Also, there's no telling what kind of crazy chemicals are released into the air (for you to breathe!) whenever they get sprayed. So, instead of using prepackaged air fresheners use vinegar. Using a water to vinegar ratio of 4:1, simmer the mixture for up to an hour. You'll find that the air in your house has never been fresher! Never buy laundry detergent again. Instead of using prepackaged laundry detergent, try using a combination of club soda, borax and lemon juice. Borax works as a booster to your laundry and when worked into fabric it can'take stains out. Lemon juice will deodorize your clothes and remove just about every stain you can imagine. Finally, club soda works wonders on patches of clothes or carpet that need to be spot cleaned. The carbonation from the soda literally pushes the spot out, while the salt keeps it from staining. Throw away your Windex. Trust me, you don't need it. For tough spots on your counter, baking soda will do the trick. In fact, there isn't much that baking soda can't do. Because baking soda is naturally slightly abrasive, it'll take just about anything off of your hard surfaces without forcing you to scrub for hours on end. Baking soda works particularly well on glass stove tops, all without scratching. If you're the type to use a Windex-like product for soap scum in the shower, white vinegar makes an excellent green substitute. Buying tooth whitening products is a waste of money. Tooth whitening products work by scrubbing the stains off of your teeth. Again, baking soda does the same thing, only without the bad taste, expense and scary chemicals. When combined with a mushed-up strawberry, baking soda works just about as well as anything you can buy off of a drug store shelf. Now that you're aware of some of the green cleaning options available, it may be time to stop relying on so many chemicals. For more environmentally friendly ideas, check out www.earthshare.org. From home cleaning to ideas for the office, there are little things you can start doing today that will add up to make a big difference tomorrow.